I’m a professor of English at the University of Louisville where I teach and write about issues of literacy, identity, digital media, popular culture, and creative nonfiction. I love to write and teach writing. 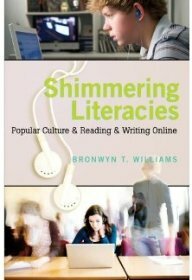 My recurring research interests have been the intersections of the literacy practices people engage in in their daily lives and the literacy practices they encounter in schools and universities. My most recent research has explored how perceptions of agency—whether a person perceives and feels able to read and write successfully in a given context— is critical in terms of how people perform their literate identities. I’m interested in how, and crucially why, people engage successfully or struggle painfully in literacy practices and what factors and forces they regard as enabling or constraining their actions. My current book that explored these ideas is titled Literacy Practices and Perceptions of Agency: Composing Identities, and was recently published by Routledge Press. My research has also taken me more deeply into the study of digital media and multimodal texts, including popular culture. I also write creative nonfiction, both as an approach to my scholarly writing and as essays on other subjects. My previous books include New Media Literacies and Participatory Popular Culture Across Borders (with Amy Zenger, just published by Routledge), Shimmering Literacies: Popular Culture and Reading and Writing Online; Popular Culture and Representations of Literacy (with Amy Zenger); Identity Papers: Literacy and Power in Higher Education; and Tuned In: Television and the Teaching of Writing. I’ve also published in a number of journals and collections. My teaching is inextricable from my writing and research. As a teacher I believe that we need to build on the knowledge our students bring into the classroom, and that we can only do this when we listen carefully to what they have to say. I am also interested in the question of how writers respond to unfamiliar literacy situations. Although we cannot prepare our students for every rhetorical or literacy challenge they will meet in their lives, we can help them develop the rhetorical awareness to negotiate unfamiliar writing and reading situations they may encounter both in and out of school. I also believe that writing can be pleasurable and fulfilling, even as it is hard work, and I hope that my teaching provides opportunities for students to realize such moments and achievements. I am currently director of the University of Louisville Writing Center. I have had a broad range of teaching experiences in composition and rhetoric, literature, creative writing, popular culture, and journalism. If you’re interested you can find my Twitter feed as well. If you want to contact me, click here. In terms of the important stuff, I have twin sons. Griffith is a writer who also works in fundraising for non-profits in Cincinnati. Rhys is a graduate student in Forestry at the University of New Hampshire. My wife, Mary Brydon-Miller, also teaches at the University of Louisville. I’m a movie freak, love to hike, play music, eat good food, and travel all I can.